Problem Description The disease appears late in the season. The disease appears late in the season. 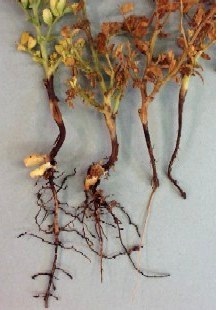 Leaves of affected plants become straw coloured. 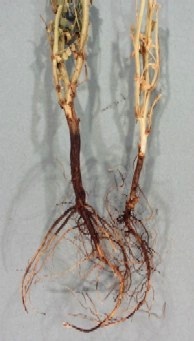 The tap roots become dark coloured, dried, devoid of lateral and fine roots and show sign of rotting. The dead root becomes brittle. Sclerotial bodies of the fungus are seen on exposed tap root, inner side of root bark and in the pith near the collar region.